As the Catholic Church in Australia celebrates a “Year of Grace”, Benedictine Sister Magdalen Mather, from Jamberoo Abbey in NSW, reflects on what ‘grace’ means to her. This year at Jamberoo Abbey it has been my task to talk on the theme of grace. Words are such wonderful, amazing, confusing, illuminating and mysterious things. ‘Grace’ has been such a word for me in the last few months. The dictionary is my first port of call when trying to grasp the meaning of words, especially ‘spiritual’ words. The origin of ‘grace’ in English is related to being grateful. I recall that moments of grace in my life are always accompanied by feelings of thankfulness and the experience of having received a gift. The Oxford Dictionary goes on to define grace as “the free and unmerited favour of God, as manifested in the salvation of sinners and the bestowal of blessings”. I always find theological definitions difficult at first and I am tempted to leave them in the ‘too hard basket’. They seem to have little to do with the everyday reality of my life. Experience however, has taught me to persevere. Spending time with them allows their deeper meaning to become clear. This often reveals their very great relevance to my daily life. The first thing that is apparent and affirming of my experience is that grace is free. It is a gift that is given and not earned. I cannot earn grace or merit it by somehow being ‘good’. In fact grace and its bestowal is about God. Grace is the outflow of the nature of God; it is a means by which God is continually moving toward me as abundant gift and blessing. I heard recently that “attraction is the power of the truth shining through”. Grace-filled moments, graceful movement, graceful action or speech are experiences that shine with a very attractive light. Grace seems to manifest an energy that is benevolent and flowing and kind and spontaneous. It is a power that is free of untruth or manipulation. We are attracted to grace. Grace is the power of truth shining through – this is the milieu of God, an outflow of the essence of God. Grace is God shining through, coming toward us meeting us, rising up within us, flowing through us, between us and among us. It is important that we do not get in the way and block it. Our part is simply to be open to receive it, to recognise it and to know ourselves blessed. One of my favourite passages and also one of my deepest comforts is found in the second letter to the Corinthians. St Paul is complaining of a thorn in the flesh which buffets him continually. He pleads with the Lord to remove it and hears so clearly in reply: “My grace is sufficient for you, for power is perfected in weakness”. Like St Paul, I need to relax and stop worrying about being an imperfect human! The Lord is exhorting me to know my imperfection and powerlessness. This place of truth is the only one from which I can truly open to the delightful grace of God doing for me what I cannot do for myself. It is the place of paradox, where power is perfected in weakness. The God of grace enables my living, and I come to experience myself as loved and favoured in God’s sight. Grace will always do more for me than I can ever do for myself. There is a deep connection here with the will of God. God’s will is a beatific will, that is, a will that can only bless. A beatific will imparts holy bliss. The will of God is the dream God has had in the creation of each of us – full of grace and truth. Author’s note: With thanks to Father Michael Casey OCSO for the expression “attraction is the power of the truth shining through” and for the idea of the beatific will of God as dream, imparting holy bliss. 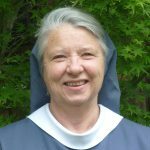 Sister Magdalen Mather is a member of the Benedictine community at Jamberoo, NSW, where she regularly directs group retreats and gives spiritual direction to those staying at the Abbey retreat cottages.